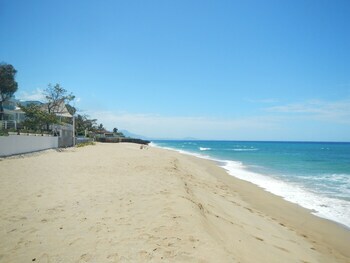 Located in Sosua, Grand Laguna Beach is by the ocean and close to Mundo King Art Museum and Sosua Beach. This 4-star condominium resort is within the region of Encuentro Beach and Playa Dorada. Make yourself at home in one of the 30 individually decorated guestrooms, featuring kitchens with refrigerators and stovetops. Your room comes with a pillowtop bed. Rooms have private furnished balconies or patios. Wired and wireless Internet access is complimentary, while 40-inch flat-screen televisions with cable programming provide entertainment. Relax on the private beach or enjoy other recreational amenities such as an outdoor pool and a spa tub. Additional features at this Colonial condominium resort include complimentary wireless Internet access, concierge services, and barbecue grills. Grand Laguna Beach Sosua is an amazing Sosua lodging choice for your trip to Dominican Republic. With numerous amenities for guests such as jacuzzi or spa, concierge, airport transportation, you will wake up at Grand Laguna Beach Sosua feeling excited every day for your time in Sosua. Don’t let this amazing reservation opportunity pass you by, book your stay at Grand Laguna Beach Sosua today to make the most of your time in Sosua, Dominican Republic.